Well here it is as promised, the full length version of the replacement of brake shoes. It seems my viewers have an interest in 2 things in particular, brakes and check engine lights so here are some brakes for you. To tell the truth I don’t do too many drum brake jobs these days so I’m a little rusty but the principals here are sound and should get you through a basic drum brake job. A couple of things to note here, I replaced the drums on this particular job but if you have enough „meat“ left on the drums you can have them machined for a lot less than replacing them. 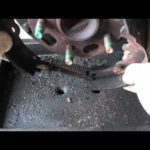 Also, I didn’t get the removal of the drum in this video because of time constraints however you can go to the „Drum Brakes, a Quick Look“ video to see how to remove them, here’s a link.